Nice perspective - good to know where the outhouse was located! Has anyone ever found a trail in the canyon, leading directly southeast up to the National Trail? I know there's a trail that crosses the wash and zigzags up to the Goat Hill mine tunnels. And there are trail traces going west on the mountainside that eventually lead to the National. I forgot to mention that as you go east along the slope from Max Delta, there's an area that has several dugout shelters - under overhangs, with some low stone windbreak walls. Also there's a rough wagon road that goes up the hillside to a minesite, from the current roadway. That mountainside below Goat Hill must've been a busy place once! Where exactly is this located? And can you still hike to it? It's still there. Just go southwest about a 1/4 mile from where the San Juan road and the road to telegraph pass intersect. Check the views on www.bing.com and you still see the area really clearly. Interesting to see this post about Max Delta Mine. I'd like to know more of the history. I believe my grandfather, Claude McLean, was part owner and assayer for the mine. From what I know, he and several miners bought it and mined it during the depression. It brought in enough income to support several families till the economy recovered. This place is amazing. Hiked the mountain, and found 2 1936 Coors & Budweiser beer cans rusting among the rubble. Some mines are filled in so that you can't go in them. Amazing enough, a friend and I sneaked into the Max Delta Mine back in the late 1970s. The adit portal (tunnel entrance) had been bulldozed in by then but further up the mountain was a shaft we entered into. It was very dangerous. I can't fathom that some people are still exploring this mine after all these years. A freind of mine and I snuck into that mine, also in the 1970's. the lowest level was submerged in water and had huge quartz pillars separating the two rock faces. the higher level (don't remember how many levels there were) was a mine cart railroad suspended between the two rock faces on timbers. your could look right down between the tie toward the loweest level. I visited this place earlier this year while on a road trip to check out abandoned places in the Western US. I hiked to the concrete foundations and several horizontal mine entrances. It was a pretty easy hike with some beautiful views. I didn't try to enter the mine though. Feel free to check out my site www.placesthatwere.com if you're interested. Hey we're are the entrances I wanna check it out sometime. Hey Kat did your great grandfather dig the mine or found it? 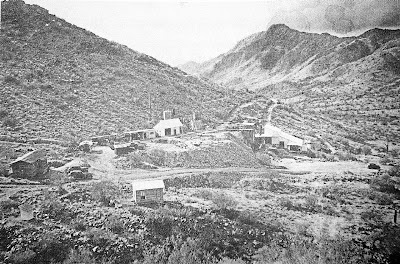 There was a lot of Spanish and Jesuit mining going on in the 1700 to 1800's.